Hi everyone! I’m part of this great product swap where a bunch of us teachers get together and try out each others teaching materials. This is really going to be fun, so make sure you check out the other blogs as well by going to Mrs.Standford’s blog to check out the linky party! She teaches French in Canada to Jr. High level students and has quickly become a great teaching buddy of mine! Make sure to follow her TPT store here, here TN store here and her FB page here. Also, here blog is here, make sure to follow it as well! She blogs about French and French culture, so make sure to check them all out! Magic Potion Recipe – French Halloween Writing Lesson or Ma Potion Magique. This is such a fun and creative activity that my 9 year old son absolutely adored!! First, we practiced some of the vocabulary words that are shown in the packet and then he got to create his own magic brew! He loved that part the most. Even though it was a little early for a Halloween activity, he was so in the spirit of making a spooky, creepy witch brew! He was very secretive when he wrote out his potion list as you can tell by this picture! I wanted to take a picture of his finished recipe, but he said it was secret and that he was going to make the potion tomorrow! Yikes! LOL…I love how he uses his creativity that way and this activity sure did bring it out of him! I think this product is great for a variety of levels of French students because you can let them work at their own level. I think students in grades 4th-10th would have the funnest time with this activity. It’s such a fun way for them to practice different animal words, body parts, as well as recipe type vocabulary like “a pinch of”. Make sure to grab this product for yourself here! You won’t be disappointed! I’m sure you have heard of the Common Core standards by now if you are a teacher in the United States or even if you are homeschooling there. They are a set of standards that are slowly, but surely being adopted by states in the United States. Basically, they are a set of skills that students should learn by the end of each grade level. If you want to check them out, you can click here to read the .pdf for math common core standards. I’ve created a packet of Quick Common Core Worksheets with a Back to School theme that teachers can use in a center or as a warm up to their regular lesson. The great thing about these worksheets is they are leveled for the beginning of the year. Since students haven’t learned the new common core for the grade level, they are based on the previous year’s common core standards while easing the students into their new grade level. To view them at TPT use these links. For Back to School Quick Common Core (1st grade), click here. For Back to School Quick Common Core (2nd grade), click here. For Back to School Quick Common Core (3rd grade), click here. For Back to School Quick Common Core (4th grade), click here. For Back to School Quick Common Core (5th grade), click here. If you’d prefer to shop at Teachers Notebook, you can check out the Quick Common Core packets here. Also, although I haven’t added these to my site yet for purchase, you can email me a yvonne @ mixminder (dot) com and I can send you an invoice. Each set costs $2.50, but if you buy them directly from me, you can receive a 5% discount. As many of you know, my husband is Canadian and we try to celebrate Canada Day no matter where we live. It’s a fun little family tradition we have and it helps our children to learn about their heritage. Click on the picture below to be taken to my other website (Mixminder) where you can download this Free Canada Day word search. Also, make sure you check out my TPT store for more great French, Spanish, Math and Writing lessons! New Summer in French Booklet! Hi everyone! I just released Summer in French onto TPT and on TN. Summer in French is a booklet that focuses on the names of different summer items in French like swimsuit, sun, swimming pool, etc. I also created this booklet for Spanish too! So make sure to check that one out here. I’ve been meaning to set up a new storefront for many months and now I finally have 1/2 of it up and ready to use. Click on the tabs to view my various products. The cool thing about buying my products from my own website as opposed to TPT or Teachers Notebook, is that you will receive a 5% discount on everything! So, try it out and let me know what you think. I have over 160 products, so I’ll continue to add them over the next few days, so make sure to come back and see what else I add. Also, if you are into freebies, head on over to my other site mixminder.com for tons and tons of freebies! I created 4 new Easter products for French and Easter. Click on the links below to purchase them at TPT. Alternatively, you can buy them at Teachers Notebook. I have lots and lots of fun and exciting new products out for Spring. If you want to see them all on TN, click here. Scroll down to see a few of my children’s favorite ones. Check out my shops on Teacherspayteachers or on Teachers Notebook! 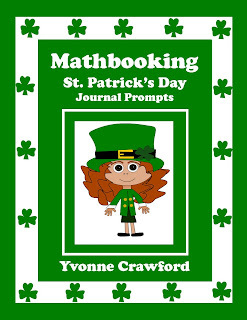 St. Patrick’s Day Fun Books! 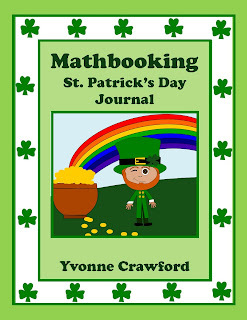 I have many fun St. Patrick’s Day Books for sell at Teachers Notebook and TPT. The first book is a SUPER silly book. 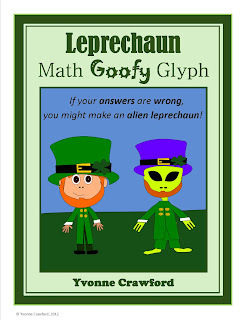 It’s called Leprechaun Math Goofy Glyph. If your students solve the problem wront, then they might end up with an alien leprechaun instead of a boy or girl leprechaun. This book is for 2nd and 3rd grades. It has some stencils in the back that you can print out for your students to use to make the glyph or they can draw their own. 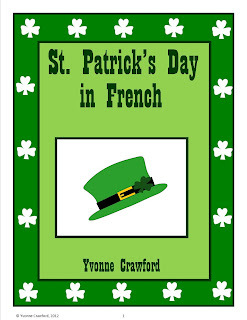 The next book is St. Patrick’s Day in French. 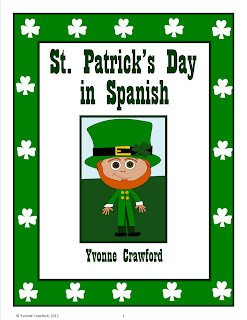 I also created St. Patrick’s Day in Spanish. 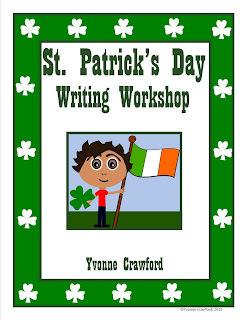 St. Patrick’s Day Writing Workshop is a fun way to introduce St. Patrick’s Day vocabulary to your students while helping them increase their language skills. This booklet can be used at writing centers or workstations in a classroom. You can laminate the cards, then place them at different stations to help your students remember the words. Each writing center might feature one of the four different writing activities. Another option is to hang the cards on your word wall or bulletin board and use the writing activities as daily activities that students can complete during the class period. 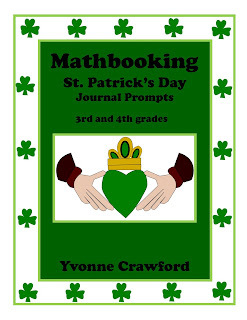 I also created three different Mathbooking St. Patrick’s Day Journal Prompt booklets. Each contain 10 prompts and are appropriate for different grade levels. Thanks for stopping by my blog and please let me know if you have any questions, comments or requests!